177 Jan.1941 Feb. 1941. 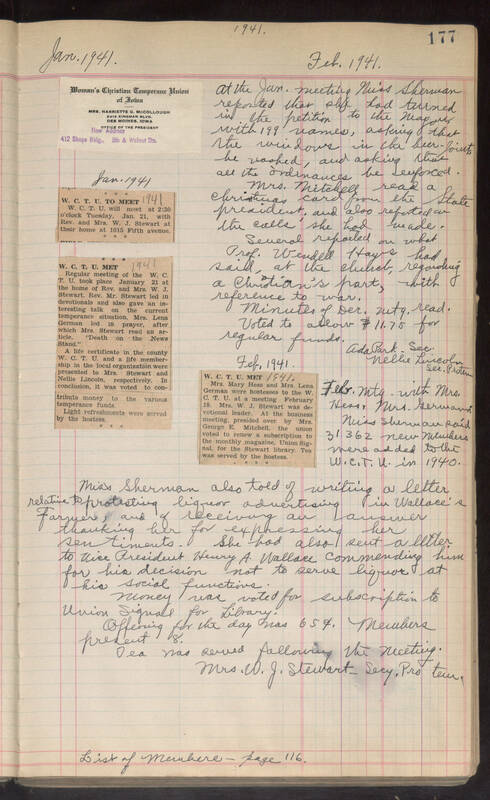 At the Jan. meeting Miss Sherman reported that she had turned in the petition to the Mayor with 199 names, asking that the windows in the beer-joints be washed, and asking that all the ordinances be enforced. Mrs. Mitchell read a Christmas card from the State president; and also reported on the calls she had made. Several reported on what Prof. Wendell Hays had said, at the church, regarding a Christian's part, with reference to war. Minutes of Dec. mtg. read. Voted to allow $11.75 for regular funds. Ada Park. Sec. Nellie Lincoln Sec. Protem Feb. 1941. Feb. mtg. with Mrs. Hess & Mrs. Germann. Miss Sherman said 31362 new members were added to the W.C.T.U. in 1940. Miss Sherman also told of writing a letter relative to protesting liquor advertising in Wallace's Farmer, and of receiving an answer thanking her for expressing her sentiments. She had also sent a letter to Vice President Henry A. Wallace commending him for his decision not to serve liquor at his social functions. Money was voted for subscription to Union Signal for Library. Offering for the day was 65c. Members present 8. Tea was served following the meeting. Mrs. W. J. Stewart-Secy. Pro tem. List of Members-page 116 images-3 newspaper clippings and one business card. Business card at top left of page and 2 newspaper clippings under it. One newspaper clipping in center of page.